I am an audio for film nerd, but you probably already knew that. As a holder of that nerd status, I also have an affiliate relationship with B&H Photo. 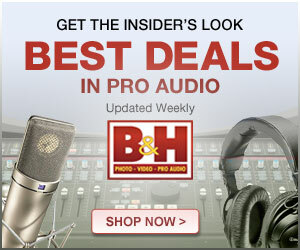 And B&H Photo is pretty much like a kid's favorite candy shop, but for a middle aged, audio for film nerd. One of the great things that B&H brings to the relationship is lending me gear for reviews and evaluation. I cannot thank them enough and I hope that some of those reviews have been helpful to you as well! I also want to thank you for using those affiliate links when you buy from B&H in cases where the reviews were helpful. You don't pay more and we get a little fee to help keep the reviews coming. Everybody wins. I was delighted when my B&H friends came to me a couple of weeks ago and asked if I'd like to share my wishlist over in the Pro Audio section of their website for a few days. The list includes things I own, have recently tested, used on previous gigs, or just wish I could use at some point. If you're into that sort of thing, you might get a kick out of this. And while you're there, you might consider creating your own wishlist. You could win a $1000 gift card for B&H if you share it.